One of the persistent recommendations during our father’s ICU days to stimulate the unconscious brain was to repeatedly play his favorite music or a recording our voices. Trusting a positive response to the music than to our voices, the choice of which to play was an easy one. We did it in the ICU, later when in a private room, and also when at home. A cousin of ours gave us a CD by one of those new age teachers. The recommended dosage to play was everyday for one hour and continue this for at least a month. Did we follow it? Ofcourse we did. I read somewhere that classical music helps, especially with a varied tempo. So Hindustani and Carnatic instruments would rock on in his ears when asleep. It is beyond doubt for me that music helps and what we did helped. Although I don’t exactly know how. This seems to be the conclusion of most of the literature on music therapy - very effective, uncertain strategy and studies to channel the efforts for maximum results are still at their fledgling best. I personally know it has helped me a lot. Learning to play the instrument Veena has been on top of my wish it for a while. What better time than now when the concept of time has very little meaning. So I started my classes with great love and dedication. It has been a little over six months and I can play some very simple songs or ‘geethams’ as we call it. I never miss a class unless its completely unavoidable. Went to classes during all the urine infection days, days of exhaustion of due to sleep deprived nights, days of apprehension when we knew something was amiss, but knew not what. After most classes, especially during the tough days, I step out of the class feeling calmer, peaceful, joyful and hopeful. Yes music is therapeutic. Then there is always the practice at home. I sometimes sit in our father’s room and make him listen to my practice. He was initially amused and at times it would put him to sleep. I like to think it’s the melody and not boredom. Some days there is more company like our mother, the nurse and / or my sister would sing the basic lessons for me to practice. One evening when he was sitting on a chair and was gesturing desperately to be shifted to bed, I told him it would be done once I perfected a new song. He sat through the whole arduous practice not looking once at the bed and smiling each time I had to start over and relieved when I was finally done. 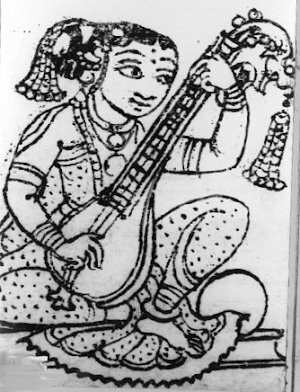 Playing the Veena, among other things I do during these times, lifts my spirits and infuses a certain joy in my being. Music therapy is as important and necessary for not just people who are ailing physically but for their caregivers as well. I am sure it helps my father to have a joyful daughter.